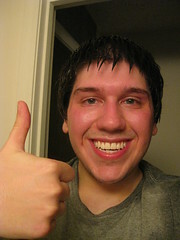 The above picture was taken after my run last night. That's not all sweat... some of it's rain, too. What can I say? I'm dedicated. I am 100% DONE with Peoples and Russian Culture. I just have to show up to Peoples next week, listen to people give their presentations, and that's it. I still have Ancient Egypt tomorrow - and the final take-home test - but that's not a big deal. And I need to take the Russian final(s). And finish up my capstone. Beyond that I'm good to go. This weekend may be relatively eventful. Work, studying (er, probably not), possibly Red Barn Blues (a blues music festival), a stand-up comedy show with Caitlin (!!) and hopefully Amanda, and the Russian majors farewell lunch/brunch. Good times. In a little over a week I will have even less to talk about than usual. Huzzah for graduation! Congrats!!!! Im assuming you are getting your BA? and i may have already asked but are you going on to your masters? Thanks! Yep, I'll be getting my BA in Russian. yes!!!! i hardly ever go back now. it used to be so fun. then everyone left. boo. im on my way to my BA in child dev, im looking at two more years. then im getting my teaching credential. i may get a masters sometime in the future too. so you're planning to be an elementary school teacher? that's really cool - in South Korea or wherever I end up next year there's a good (very good) chance that I'll be teaching little kids English. that'll be... interesting, considering how I have just about no experience with kids, haha. Why are you going to south korea? that's awesome! oh awesome! That would be a very good way, indeed. I would love to do a semester abroad. Fortunately, i don't have to take out a loan since my parents and i can afford the local state university tuition. it's about 2 grand a semester which is nothing compared to the UCs around our area. haha, U of I (University of Illinois) is ridiculously expensive, even in-state... to get a good price on tuition I pretty much had to leave the state, unless I wanted to live with my parents for college. ugh. yeah i live with mine and while it does get annoying, pretty much everything is free so it helps me save. and i dont have to cook. yeah, saving money is definitely a good thing... but I'd seriously kill my parents if I had to live with them full time. ai yi yi. will you be living at home when you go to sacramento state? or will you be moving out? good pic btw. very.....toothpaste commercially. hahaha what can I say? My teeth are bright, white, and sparkling clean!